On this page, we give news of prayers, meetings and gatherings in Australia in connection with the Pilgrimage of Trust on Earth. Please check from time to time for any updates! For the second time in 2018, a Taizé brother was able to visit different parts of Australia. In November, gatherings took place in Tasmania, Victoria and the Northern Territory. Using Brother Alois’ 2018 proposals “An inexhaustible joy” as a basis for the pilgrimage, here he shares something of what he experienced. Arriving from the late autumn of Europe, I was expecting to find spring weather in Australia, but Tasmania had other ideas! The wind and rain however, couldn’t mask the warmth of the welcome felt throughout the visits in the island state. What does it mean to live in community? Well there is a saying ‘it takes a village to raise a child’. For those of us raising children in this community one of the best things is it means having a rich network of friends/role models/confidantes for our kids, there for them when we can’t be, or when our children need someone other than a parent to talk to. We love, care for and pray for each other’s kids. It means we have company in our joys and pains and illnesses. And at times when we might feel tempted to withdraw, community doesn’t let us. It makes healthy claims on us. And brings encouragement. On a practical level it means we can share lawnmowers and trailers and toys and books, being interdependent gives us a less materialistic way to live. It means we are committed to a diverse group of people which gives us frequent opportunities to look at things in different ways, have our priorities rearranged or challenged. It urges us to keep coming back to our common ground. That evening, we prayed together in the Anglican church. Around 15 young people came from a Pentecostal church in Launceston. It was wonderful to see how they enjoyed the songs from Taizé, silence and prayer around the cross. A short visit to the Benedictine community of Notre Dame, taking part in their prayers in Latin of Sexte and None, and experiencing their warm table hospitality, provided a break on the drive back to Hobart where there was evening prayer at All Saints’ parish church. Flying across to Victoria, an evening prayer was held in St Kilian’s Catholic church, Bendigo, a marvellous wooden building, together with the Youth Coordinator for Sandhurst diocese. And then the next day, there was a beautiful visit to Mountain District Christian School in the Dandenong Ranges. Some pupils from this school made the trip to Taizé over the past years thanks to one of the teachers. Showing the film about the community led to a lively and deep discussion with the year 12s. 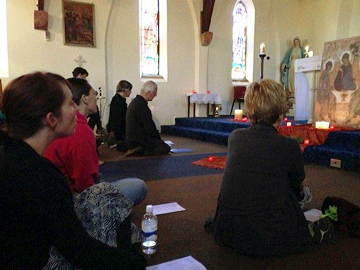 A monthly prayer with songs from Taizé has been taking place already since several years at Trinity College, Melbourne. On the Friday evening of the Bourke Street attack, it was good to be together in prayer and silence, remembering what had happened a few hours before. “About thirty young people gathered in Carlton North at the Mercy Hub, a community space provided by the Sisters of Mercy. The day began with a prayer together. The Taizé brother then led a Bible discussion, looking at the reading from the morning prayer, the Beatitudes in Luke 6.17-26. We broke into groups and meditated on Brother Alois’ notion of inexhaustible joy. What emerged from the small groups was learning with others on subjects such as wealth, advice and divisions. Before lunch, we met for midday prayer. 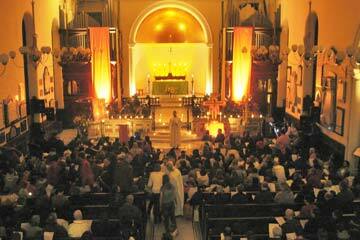 The light and acoustics of the space provided the setting for a peaceful, joyful time of worship. The retreat group was then joined by two young people, Josh and Mimi, working for the Catholic Alliance for People Seeking Asylum. They spoke to the group about hardships facing people seeking asylum in Australia, and the role of their organisation in lessening these. Following this, we watched the film on the life of Brother Roger. This enriched the knowledge of both old and newcomers to the heart of Taizé. And then finally, it was on to Alice Springs for the last stage of the pilgrimage. “Last week I attended the prayer with songs from Taizé with a brother from the community and members of local churches from around Alice Springs. Previous to that night, it had been a few quite stressful weeks at work and I hadn’t given myself a chance to sit and reflect let alone given God much of my time. I’d heard at Mass the evening beforehand that this special Taizé service was being held and thought it would be a nice experience to attend. Entering the church I felt instantly at ease. It was nearing night time and there were candles lit on the altar and a sense of peace in the room. After the brother introduced himself we sung a few chanted Taizé songs. It was so lovely just to close my eyes and feel at peace with God and to have the opportunity be with him without the distractions of life. We also read some readings and had time to sit in silence and meditate on what had been said. What I really enjoyed was the simplicity of the lines in the Taizé songs and the gentle repetition. It allowed me not to preoccupy myself wondering what the next line was but rather enjoy the hymn and use it to be still with God. “Be still and know that I am God” from Psalm 46:10 was really prevalent to me that night. And the following evening, sat around the fire at Campfire at the Heart, a retreat centre just outside the town, people shared about the unexpected joys of the past months, which point towards an inexhaustible joy. Both David and Steve spoke about a visit we made to Ltyentye Apurte Community (also known as Santa Teresa), an Arrernte indigenous community 80km north of Alice. The women were painting crosses with traditional designs in the parish workshop. Someone said, go up to the big tree behind the church and you’ll see the youngfellas making wonderful things. And so we did. And we saw the youngfellas crafting tools and instruments using the skills that their grandfathers had taught them. Joy was on their faces as they showed us their work. Inexhaustible joy is catchy. "An inexhaustible joy", the theme that is at the heart of Taizé’s life for this year of 2018 was also the theme given to the visits that a brother of the community made in several states of Australia to the end of May. "These visits began began with a retreat at the St Joseph Conference Centre in Perthville, a few miles from Bathurst (NSW). During the retreat, we were able to reflect on the 4 proposals that Brother Alois wrote to help us go together to the sources of this inexhaustible joy. This is a great challenge for young people in today’s society, but the beauty of nature where the centre is located helped us dare to enter into the subject. Prayer several times a day made it possible to find the courage to face the obstacles that sometimes seem insurmountable, to discover a joy, sometimes very small but which creates the confidence to go ahead. On Saturday evening, the prayer was opened to people living in the area around. Some had come a little earlier and were able to share about their commitments. Many of the participants traveled to Sydney to join the evening prayer at Pitt Street Uniting Church. It was not the first time the brothers had come to pray in this beautiful historic church - already during the first visits in 1985 and especially during the pilgrimage of trust in Sydney in 1984. In Adelaide, there was a "workshop for young adults" at Brougham Place Uniting Church. There too, the pilgrimage of trust has roots, the young minister brought a group of young people to Taizé. He came with some musicians to lead the prayer the following day at St. Peter’s Anglican Cathedral. 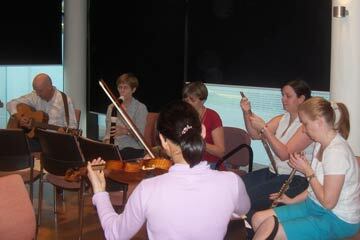 The next stop was in Brisbane where again a "workshop" was being held in one of the rooms of the Catholic Cathedral. All participants then walked together to St John’s Anglican Cathedral. It was a sign of communion, a seed of peace in the heart of the city." In September 2016, a brother accompanied a retreat in the Diocese of Wollongong. 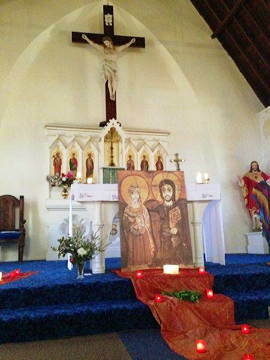 A young couple from Tasmania, both of whom had been volunteers in Taizé, took part in this retreat. One of them wrote after: "We came away feeling nourished and renewed. 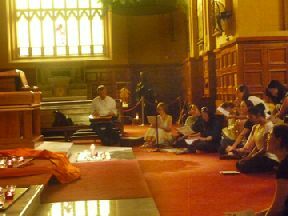 It was so precious to be able to re-centre ourselves once again using the spirituality that Taizé offers, which first set us out on this course of working for the church in Tasmania. "It was very easy to fall back into the rhythm of prayer three times a day. That was something we tried to keep up when we left Taizé, but over time it fell away. We were grateful to be reminded of how moments of prayer and stillness throughout a day can enrich it substantially. "I was not at all frustrated with the ’very mixed up group’. I loved being reminded that community can form so simply when hearts are opened. I missed everyone very much after we left. I remembered with vivid clarity why I came away from Taizé with a fervent desire to share life with others." "It was a joy to pray in the office of the Council with some of the persons working there, welcomed by the general secretary, Father Shenouda Mansour. After there were prayers in a Catholic and an Anglican parish in Sydney. Everywhere, it gave an opportunity to gather people from very different backgrounds, to pray, but also after the prayer itself people could meet, speak and share together. In Newcastle, in a Uniting Church, the presence of young adults were noticeable. The choir was made up almost all of young people. "Listening to people, we understand more the questions of the Australians, especially young people: search for meaning, search for identity in a very multicultural society, how to face the challenges of immigration, climate changes and which role can youth play in the Church. Here we saw that they had a place and they came. "The Proposals for 2017 come at the right time: opening paths of hope, yes, but TOGETHER. Perhaps these prayers were a humble way to open doors, find hope and share it with others." My last visit to Perth goes back to 2009. On arriving this time at the new domestic airport, driving down the new highways, seeing the new rail-links and suburbs sprouting freshly around new stations, you get the impression of a city on the move. Certainly, the mining boom has brought money into the state capital. On the first evening, meeting with the youth who had been to Taizé, it was easy to grasp that their longing went beyond material wealth. And yet, to make ends meet, to have a sense of independence, most of them are holding down jobs and studying at the same time. Where can they find time for listening to that deep-down longing in the midst of all the hustle and bustle? One young woman told how through the pilgrimage, she has begun to find her feet in her local Church. Working with children and running the youth group were her way of sharing the faith that she is discovering. Not coming from a family with any church tradition, this was a great step. Meetings in local schools, where there was always a time of worship using songs from Taizé, showed as well how much young adults long for spaces of quiet and reflection. It’s no burden to leave aside the headphones and mobiles for a while - in fact it’s a liberation. Gnarla Karla Boodja Ngalluk Jurapiny Wanju Nunnuk Ngallah Nyoongar Boodja Nitjah Ngallah Moorts Boodja Koorah Koorah. Nitjah Ngallah Karla Boodja Koorah Waanginy Gaany Ngallah Boodja Koorah Waaginy Kedala. Ngallah Yaakiny Ngallak Nyoongyar Nyitiyang Ngallak Ngallak - A -Gaany. We are pleased to welcome you all to our Nyoongyar country. This is our ancestors’ land from Dreamtime. This our homeland of history and as one proud people of our land through history till today, was stand together black and white. We are one - we are one - we are one. Rev Samuel is a Uniting Church minister who acts as a prison chaplain visiting many First Australians who are in jail. I knew I was meeting someone who embodied the Courage of Mercy. He invited me to accompany him on his visits, but unfortunately I was flying out the next morning. You can be sure that next time, I will accept his invitation. After meetings in 2012 in Africa, 2013 in Asia and 2014 in the Americas, in February 2015 Brother Alois made the final stage of this pilgrimage to every continent by travelling to Australia and New Zealand, together with some brothers of the community. One of the brothers tells the story of this pilgrimage at Listening to young people from Oceania. 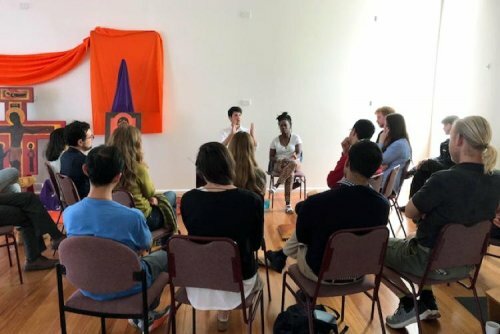 "Ten young adults who have experienced Taizé, whether through their local parish or in France, gathered at least monthly from July 2014 onwards to prepare for the all-day event that occurred in Melbourne last month. From as far and wide as Indonesia, the Netherlands and Hong Kong and a variety of Christian backgrounds including Uniting, Catholic, Baptist and Anglican, small meetings would be held in dining rooms across the suburbs of Melbourne. These foundational gatherings, including the regular CBD prayers, were opportunities for ecumenical sharing, cooperation and planning together. St Paul’s hosted the final evening prayer of the day-long gathering on February 8, where children joined the brothers at the front. The first song, “Bless the Lord,” doubled in volume as families, grandparents, professionals and more young people joined for the evening prayer. Br Alois delivered an address with a strong ecumenical message. “Christ gave his life to gather together all human beings,” he said, “He calls his followers to be salt of the earth by being signs of peace in the world.” The time came for the “prayer around the cross” where Bishop Peter Elliot and Bishop Philip Huggins knelt around the horizontal cross with the three brothers from Taizé. Participants followed. Candles were kindled for the celebration of the resurrection. Twelve hours of pilgrimage then concluded. “It was a beautiful experience and left me with a sense of contentment that I haven’t felt for a while,” wrote Michael Walter from the St Vincent De Paul Society of Victoria. The organising committee is very grateful to all who supported the smooth running and conviviality of the day. They were asked, “When is the next prayer?” with overflowing enthusiasm before singing a final “In the Lord I’ll be ever Thankful,” and returning home to their various Melbourne suburbs." "Brother Alois mentioned in his speech that he was touched by the destruction of the city after the earthquake four years ago. By talking to people here in New Zealand over the last year I felt that Kiwis are still deeply moved by the tragic events. They also gave me to understand that there was something uniting them within the shock and grieving. I saw and felt that vividly at the prayer around the cross and gave me again a little more understanding of the power of this prayer. The cross in the centre with it’s significance to death, destruction and incomprehension, but also hope for new beginnings draws people together and the queue seemed not to end. This intimate way of sharing with God and others has once more left a great joy in me." 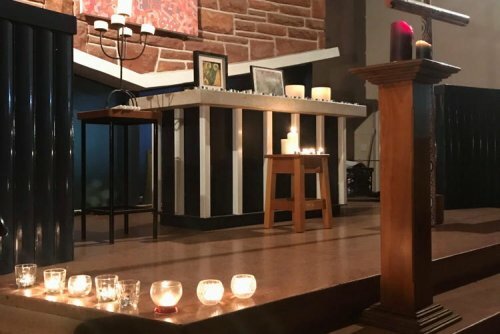 "The Taizé gathering at St Columba College on Friday 13 February was a unique experience. It was amazing to learn and find out about the Taizé community and their great impact on so many people around the world. 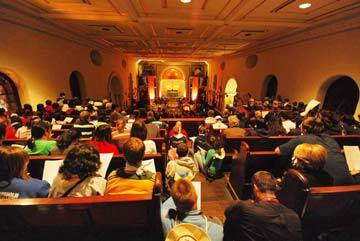 Personally, I have never been to or heard about the Taizé community before. The day was spent acknowledging their way of worship through songs, prayers, Bible readings together. It was truly a wonderful experience and generally very good to know about the different ways people communicate with God." "The service was an amazing opportunity to see and feel the Taizé style of worship, and although the songs had few words, they became so powerful with 40 or so students singing them; there was a real connection and solidarity when everybody was singing. I would definitely be interested in another opportunity like this, although I am not Christian I was still amazed at how much unity I felt in my brief time there. Later in the day we went to one of three workshops. I attended the workshop on reconciliation where two Aboriginal sisters spoke to us about how they found a path through Taize and what that was like for them. The sisters are working to reconcile all forms of discrimination on a global scale with a group of people facing similar problems as they did in Australia." During his stay in Australia in autumn 2012, a brother visited New South Wales, the most populous state in the country, invited by the Council of Churches. Here are some of his reflections after the visit. The invitation came at a moment when the idea of a three year project on the theme of new solidarity was launched in Taizé. So it became clear that the visit should follow that direction. In the concept of new solidarity, there is a desire to meet each person and to forget no-one. In Newcastle, around midday, there was a very fraternel meeting with University chaplains - Christians of different traditions and also non-Christians. 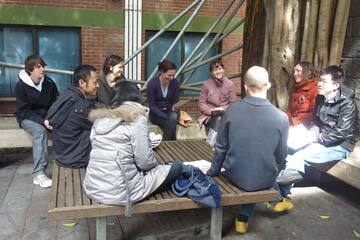 In the evening there was a meeting in the Uniting Church, close to the University. The next day, I visited a farm where the Cana Community, which works with homeless in the city, can offer hospitality out in the fresh country air, but also offer courses on cookery, serving at table, etc. After a shared meal, we prayed with those who wished to. Then in the evening at Redfern there was a prayer. We were welcomed by Pearl, an Aboriginal woman, a way of recognising that we were praying on the land of her ethnic group. It sounds trite to write it like that, but it was essential to acknowledge that the ground on which we were going to pray belonged to the first inhabitants of Australia. .
Another day, Jenny, who worked for many years on refugee projects, organised a visit to the Jesuit Refugee Service. This helped us understand better the problems often with no solution faced by asylum seekers and refugees. St Canice parish, where we held midday prayer is also committed to work with the homeless. Every Tuesday evening, on the initiative of the Coptic Orthodox Church, meals are given out at Woolloomoo for the homeless, for immigrants and for the young poor. Father Shenouda, also President of the New South Wales Council of Churches, is so radiant that he imparts trust both towards the volunteers and to those who come to eat. One very moving moment came when I heard the person in front of me get out a little plastic box saying “Please give for my son and me.” The poor widow of Sarepta was there before me. Brother Roger often said, “I will go to the ends of the earth to express my trust in the young generations.” During my last visit to Australia, I remembered this everywhere, whether it was in Darwin meeting students from Kormilda College, or seeing the large group that came to the evening prayer in the Anglican cathedral. And yet their chaplains said that many of them came from difficult family backgrounds. 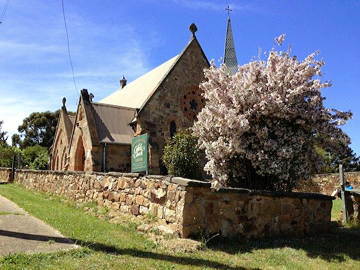 At Brougham Place Uniting Church, the young minister insisted that the choir be made up only of young people. Some of them had exams the next day.... It was the first time that they had played and sung for this sort of meditative prayer. In Wollongong, the pupils of seven schools of different traditions spent more than five hours reflecting first of all alone and then in small groups on this year’s theme of “Opening ways of trust among humans.” During the prayer, each pupil came and placed near the altar a piece of coloured cloth on which they had written a word or phrase which had struck them in the “Letter 2012”. This simple gesture was like a commitment to put into practise that word. These gatherings are especially for 18-35s, if you are outside this age group, please come along and bring some young people along with you! Heidi writes: "After the Taizé Brothers’ visit in September 2011, a group of young people were inspired to keep praying together and decided to organise a series of four Melbourne CBD prayer services over the next year to complement the other Taize prayer services already happening around Melbourne. The night was not without its dramas, the Icon of the Cross wouldn’t fit in Fr John’s car and someone parked him in so he completely missed the singing practice … many nearly didn’t make it due to getting stuck at work and of course we completely ran out of service sheets!! The Bible reading was read in five different languages, which was just a small portion of the different nationalities present. The singing was beautiful with a range of parts and amazing cantoring! We had some great feedback from those who attended: For some it was an inspiration and they want to introduce Taize singing into their own prayer groups, others were happy to meet like-minded people of their age and others simply said that they enjoyed the experience. 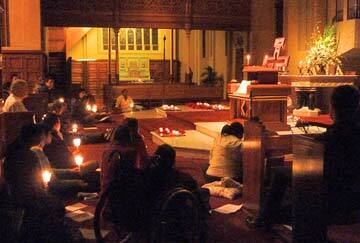 Our Facebook Group: Taize in Melbourne, Australia has now grown to 97 people! We’re thinking of offering a prize to the 100th person to join …"
In September 2011, two brothers visited several states in Australia. Initially invited by Queensland Churches Together as part of the celebration for the 20th anniversary of their foundation, the trip became an expression of the Pilgrimage of Trust in its most diverse forms. Arriving in Melbourne directly from the summer meetings in Taizé was quite a challenge! Jet lag is never easy to overcome and the warmth of Burgundy was swapped for the end of the Victorian winter, spring not quite showing its face yet. But at midday, we walked down to Melbourne University, not far from where we were staying. A time of prayer and sharing brought together students from a vast array of nationalities; Chinese, Tamil, Malaysian, Singaporean, Indonesian, Timorese, German, Filipino, Thai. Immediately, you were plunged into the multicultural reality of Australia today. Each day, we decided to take a theme from the Letter from Chile. Today’s theme was joy; joy which can be “awakened by an unexpected meeting, by a lasting friendship, by artistic creation or again by the beauty of nature....” It was the unexpected meeting with young people of so many different backgrounds which brought that joy today! Evening; prayer at St Stephen’s Anglican parish church, Richmond. Again, many young people from many different churches. Worship can be so beautiful in a church arranged simply for prayer together. Off to the mountains! Morning Prayer at the tiny Mount Macedon Uniting Church, to the north of Melbourne. The church burnt down during the Ash Wednesday bush fires in 1983, but was rebuilt by the community. Warm welcome on a very cold day. A small, but caring community. “Opting for joy is inseparable from a concern for other human beings. It fills us with unlimited compassion.” Those words from the Letter from Chile stayed with us as we reflected on the theme of compassion. Back to Melbourne for midday prayer. Chaplaincy meeting in Monash University. We’re in a huge glass windowed room. Not ideal! But with an icon of the cross, some candles and some coloured material, prayer becomes possible. People walking by on the street outside see us. Off to Geelong in the evening. The Geelong Cats are playing the same evening in Australian Football Finals – will anyone want to pray? Wesley Uniting Church welcomes us. All the benches in the church are pushed back creating a wonderful prayer space. Reflection on Matthew 26 and the story of the woman who anointed Jesus before his death helps us think about what it means for us to serve the poor. Full day programme at RMIT University. The chaplaincy building is in the old Melbourne Gaol. What stories its walls must tell! The chaplaincy is multi-faith. A huge tapestry of the tree of life adorns its far wall. Ablution rooms are available for people of faiths who need them before prayer. 70 young people gather. Once again, the number of nationalities present is incredible. Some Chinese Catholics who had been in Taizé on their way to World Youth Day in Madrid join us joyfully. Morning Prayer, Bible study, small sharing groups, midday prayer and then different workshops rhythm the day. One workshop is led by a Christian group called Urban Seed which ministers to the homeless in the city. Participants walked through the streets to the various points where the homeless meet. Another is on story telling. The parable of the Good Samaritan is retold in today’s language. Evening prayer at St Francis’ Catholic Church concludes the day. A real sense of togetherness in this building, an oasis of prayer in the city centre. Nothing more to add. Savour the beauty. Looking back on these days in Victoria, there’s only gratitude. Everything was organised by two young women, one of whom was a volunteer in Taizé for some months, the other had never been to Taizé. They didn’t know each other before. Yet they worked together contacting different churches and inviting young people to come and take part. It was a real pilgrimage of trust, the joy received throughout was a real gift. Canberra: the Federal Capital. Over 60% of the population of the city work in government ministries. The tenth anniversary of the 9/11 attacks. Prayer for peace, remembering Jesus who, risen from the dead, breathed “shalom” upon his disciples and sent them out, as the Father sent him, to announce forgiveness. Visit to a Catholic school in Bowral, New South Wales. The teacher has been to Taizé many times in the past. An opportunity to meet with the older pupils. For many, school is their only contact with church. 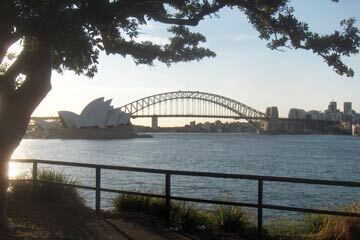 Sydney; visits to more schools, a Uniting Church girls school and a Catholic boys school. Time to show the film about the life of the community, answer questions and then prepare a time of worship. It’s important to go out and meet young people where they’re at. In the parish celebrations, they are not so many. In the evening; prayer at St James’ Anglican Church on King Street in the city centre. In 2008, during World Youth Day, Taizé led prayers in this church. It was good to be back! The rector gave us such a warm welcome. Beautiful music and a long prayer around the cross, before everyone lit their taper candles in celebration of the Resurrection of Jesus. “Meeting with Jesus”. How is it that children can understand so easily the essentials of faith? The school principal and chaplain would like the pupils to discover that prayer can be contemplative, that it doesn’t always have to be a performance or concert. With the older pupils, we spend the second lesson learning the music for some Taizé songs. In the third period, we meet with different year groups. With the help of the older pupils, we explain about prayer in Taizé and teach some of the songs. After lunch, the day finishes with a time of worship for the three year groups. Impeccably kept silence, beautiful singing, in front of an altar space created by the pupils; many icons, lots of candles. Evening; meeting in an inner city Uniting Church. The people of God in all its diversity. Drive to Toowoomba, west of Brisbane. Barbecue outside the church in good Australian fashion. Meeting with young people from different churches of the town, followed by prayer in the Anglican parish of St Luke. It’s the flower festival, so the church is bedecked with beautiful floral arrangements. One of these commemorates the victims of the floods which ravaged the town and area around in January. A journalist comes to speak of the book she is preparing. She has interviewed over 100 people who had been in treacherous situations during those dramatic days. The book will help ensure that those who were lost will not be forgotten. Conclusion of the day; evening prayer in the Anglican Cathedral. Musicians and soloists prepared during the afternoon. Most of them didn’t know the music before. But many wanted to continue afterwards. A final step in the pilgrimage; morning service in an Aboriginal church in Logan, south of Brisbane. The pastor comes from Tonga, but the congregation is made up of indigenous Australians. Joyful songs, preaching about the love of Christ and afterwards impossible to leave without sharing in the Sunday lunch. Hospitality is part of the Gospel. This indigenous congregation cannot live otherwise. 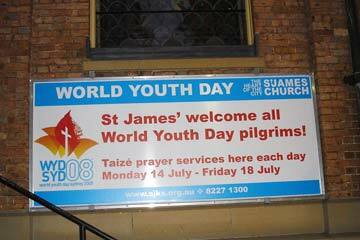 At the invitation of Pope Benedict XVI, the World Youth Days took place in Sydney from 15 to 20 July 2008. 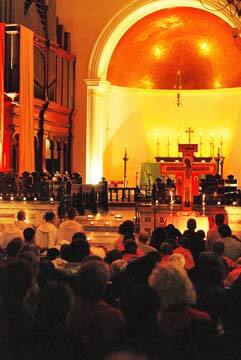 From Monday 14 July, brothers of the community led prayers with songs from Taizé, in a city centre parish. For a whole week Sydney’s streets and railway stations echoed to the sounds of animated young people from all the continents of the world. The World Youth Day had attracted a quarter of a million pilgrims who came together to celebrate their faith and their hopes. Where the massive buildings of the commercial district meet the large park opposite St Mary’s Cathedral is the lovely, warm sand stone church building of the Anglican Church of St James. And it was in this church that people came to join some of the brothers of Taizé in prayer each day. 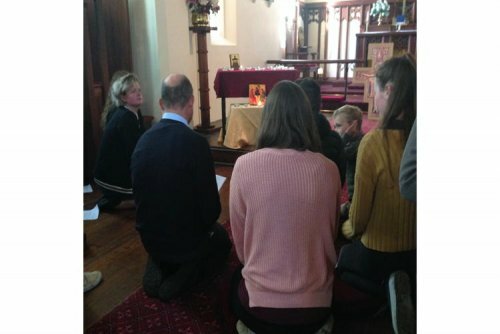 As the week progressed, more and more young people began crowding into the church until by the end of the week not everyone who wanted to get in were able to – even with up to four prayers in an afternoon and evening. A choir and instrumentalists were there throughout the week to help with the singing. There were always people of different denominations present. Young people read the Scriptures in up to six different languages. They also helped lead the intercessions. On three of the evenings, Brother Alois spoke to the young pilgrims. At the close of the final evening prayer each day the cross was laid on the floor and people waited patiently in a long line for an opportunity to entrust to Christ some of their anxieties and fears and hopes. At the final prayer, the Prime Minister of Australia who had earlier in the week spoken to the young pilgrims at the opening event, attended with his family, staying for two hours to pray with the young people. Roads in the central city were blocked off; even the famous Sydney Harbour Bridge was closed for a whole day, causing inconvenience to so many motorists. But the people of Sydney responded generously, going out of their way to offer hospitality to so many visitors. The city was transformed as singing groups, sometimes identified by their national flag, walked from one event to another along the city’s streets. How much can change, even for a city of over 4 million, when people for a few days are united in communion with each other and the whole church. With three of our brothers, I was in Australia for the World Youth Days, to which Pope Benedict XVI had invited young people from every continent. At the beginning of last week when we set off to join those gathered in Sydney, we left behind us many young people here on the hill. 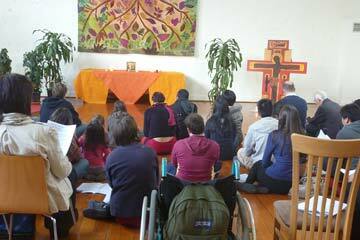 As was the case during each of the previous World Youth Days, we were invited to lead prayers each day of the week. In Sydney, it was in the beautiful St James’ Church, at the heart of the city. At Saint James’, which is Anglican, we discovered a fraternal collaboration with the young adults of the parish. In this way, young people of another denomination were involved in welcoming the young Catholics. For years now, one of our brothers has been going from time to time to this same church to lend support to a prayer with Christians of Sydney. We were happy to find this continuity. In the evenings, we ended with the prayer around the Cross, and the young people stayed on and on, to sing and to pray. Others were waiting outside, for their turn of praying around the Cross, placed on the ground. While we were in Sydney, we remembered that Brother Roger died exactly three years ago, during the World Youth Days held in Cologne. During these days in Australia, Pope Benedict XVI called on the young people to become witnesses to Christ. And here in Taizé, week after week, we also wish to do everything we can, so that those who gather here on our hill find in trusting in Christ a meaning to their life.